For a non-binding and absolutely free price quote, call our 24/7 customer service assistants at 020 3746 1366 or online here now! We are among the recognised carpet cleaners in Cathall E15. Since we first started business, Our company has done everything to establish itself as a leading and top preferred carpet cleaning service in the area. Our professional cleaning services company works with a growing number of business and private customers. We will safely clean all types of carpets and a special stain protection can be applied. We invest in and work with the most advanced professional cleaning technologies, methods and solutions, because the 100 % satisfaction of our clients is our top priority! To increase the durability of your carpet, and to look like it is brand new, book our expert carpet cleaning service now! Our competent cleaner in Cathall E15 will analyse your rug or carpet closely to identify its material and condition. A professional vacuum cleaner is used to take out as much dust and dirt out as possible. Then any removable stains are pre-treated with special stain removal products. All solutions are tested in advance for safety’s sake. Based on the type of carpet you have either steam carpet cleaning or dry carpet cleaning is performed. The steam carpet cleaners clean the carpeting with a hot water extraction cleaning machine. The dry carpet cleaners treat the carpet with dry powder, and then hoover it off. 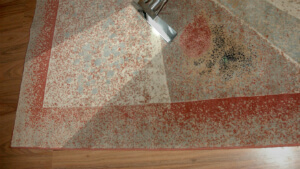 Both are highly efficient carpet cleaning methods made for deep cleaning of synthetic or natural materials. Steam cleaning needs some drying time, while with dry cleaning, the carpet is ready to be stepped on right after the cleaning is finished. Ashlee House Cleaning has been providing professional rug and carpet cleaning for commercial and domestic properties as well to the residents of Cathall E15 for over 10 years. We work only with recommended, vetted and trained cleaners, who are equipped with the newest professional cleaning technologies and with safe and yet highly efficient cleaning solutions. Our cleaners are experienced and trained to clean any kind of carpet or rug, and to remove a wide variety of different stains, such as: paint, blood, oily stains, coffee, wine, rust, tea, vomit as well as repair moth damage. Call 020 3746 1366 or send an online request via our contact form here to reserve time and date for our services provided by our carpet cleaning experts in Cathall E15. Your request will be received and processed in no time and you will get a confirmation for your booking. We have fixed prices and we clean also on weekends and public holidays. When you book several of our services at the same time, you will not only save time but also money because we will give you discount off the price. No advance payment is required for booking any of the services we provide.